Beth Hempton and I have loved having the opportunity of doing workshops on graphic organizers for homeschooling support groups and teachers’ workshops. We love teaching old and new friends how to make lapbooks, our favorite mini-books, and other tools for teaching and learning. It is especially rewarding to see some ‘traditional textbook curriculum” moms and teachers learn that hands on projects such as mini-books and lapbooks were not only educational, but also fun! It’s never a bad thing to spice up book work with a colorful and creative hands on activity, and graphic organizers such as lapbooks can be much less intimidating to a reluctant writer than staring at a blank page. Believe me, I’ve been there. What is a graphic organizer, anyway? We made two different types of mini-books at our last workshop – an accordion book and a layered-look book. When we do these workshops, we always show examples of mini-books and lapbooks that have been made by our children as well other students we have taught. For example, here is a very simple mini-book that an elementary student can make. 1. Using one single piece of 8 1/2 x 11 inch colored paper, hold the base piece of paper vertically, then fold it in half lengthwise. 2. Out of contrasting paper colors, construct a simple flower clearly showing the petals, leaves, stem and roots, as shown in the picture on the far left. 3. After gluing the flower to the top half of the folded paper, cut through the flower and the top half of the paper, to the fold. Make three cuts so that the flower, leaves, stem and roots each have their own section. 4. On the inside of the flaps, label each section, as shown. 5. Have your student write a short description of each flower ‘part’ on a separate piece of paper the same size as the one on the lapbook. Have him copy the description it is proper place opposite each label. What is and how do you make a lapbook? Here is one my son made about space. The base is simply made from two file folders glued together (directions below). For the cover, we wrote to NASA to procure some gorgeous, professional photos pertaining to space. 1. Take two file folders, laying vertically open on the table in front of you. 2. One at a time, take the outside edges of each file folder and fold them in towards the center fold. Crease well, then let them open again. 3. Glue together the sides of each folder that are next to each other (that you just folded toward the middle). Voila! That is all there is to it – you can make lapbooks bigger by gluing on more folders or attaching additional flaps inside. Below you can see what it looks like opened up. As you can see, inside the lapbook there is space for vocabulary, illustrations, charts, book reports, clip art and anything else your study includes. I like the layered-look books because it allows students to do a fair amount of writing, depending upon the number of pages it contains, but is much less intimidating than that blank sheet of paper because it is divided into many small sections. As with all graphic organizers, anytime your elementary student is organizing information, he is building a foundation for learning more advanced writing skills as well as for learning how to take notes. Because of the many benefits, at every grade level and in every type of curriculum we have, Train up a Child Publishing curricula uses mini-books, lapbooks and other graphic organizers. This site has every type of mini book imaginable as well as free templates! This site has guided reading materials and MANY mini book ideas and resources for elementary ages. This is one of our favorite original sites with great instruction and ideas. Check out the blog for this site as well. 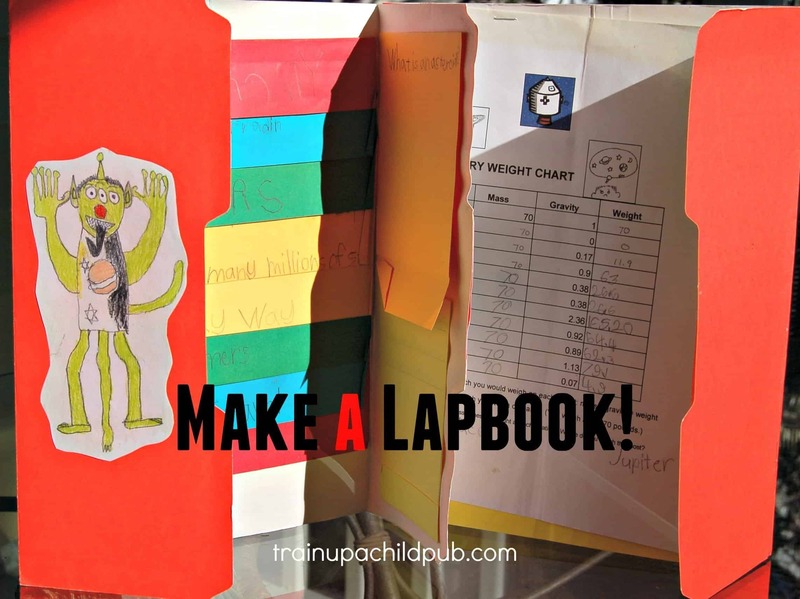 This has an array of lapbook information for all ages. In fact, at The Homeschol Lounge (highly recommended!) you can join a group of homeschooling moms who share lapbook ideas and resources. These are resources and other links for educational scrapbooking. This is a free software download (full version) to begin digital scrapbooking immediately. Even if you use a traditional curriculum, please give your students a chance to do some thing hands on, colorful and creative! Enjoy! P.S. If you have a reluctant writer or two at your house, in addition to trying mini-books, you might find our reluctant writer series helpful. See Reluctant Writers – Part 1 The Early Years, Reluctant Writers – Part 2 The Middle Years and Reluctant Writers – Part 3 High School and Beyond. I’m sorry you found links not working! Thank you for letting me know. I just checked all of them in the article and the only one I found not working was the one to the free scrapbooking software. The url is http://www.scrapbookflair.com. Sometimes opening the post in a different browser will help. I’m very glad to have read this article. It has helped me gain a great deal of knowledge on lapbooks. I would love to read more of your articles!